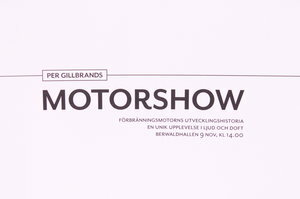 Berwald hall, Stockholm, 9 november 2014 at 14:00, Per Gillbrand is giving his last motor show about the history of the combustion Engine. It is packed, 1100 persons is there to get a unique experience in sound and fragrance. This booklet served as program for the day and is an excellent document on the internal combustion engine history, and demonstrate the models Per Gillbrand personaly constructed after the original Engines. Further more there is a QR-code for every Engine that will link you to a film so that you can experience the sound and design of the Engine.